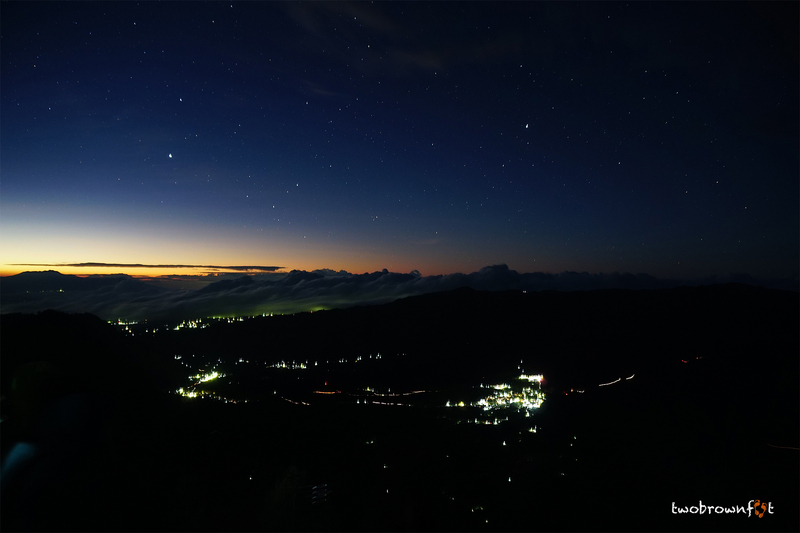 We had to wake up at 2:00 a.m. in the morning to ensure we got a spot at Penanjakan — the popular viewpoint. But we weren’t the only ones. The cottage was buzzing with alarms and hurried footsteps. Eko (our guide) met us at the reception area and looked pretty bundled up. He was surprised that we hadn’t worn thicker woollens and said it will get cooler at the viewpoint. We wouldn’t be coming back for breakfast and Basil had to rush back to get our night bags. Local jeeps were lining outside the main waiting area and people started getting impatient. Guides scurried around and tried to choose their preferred vehicle. The whole arrangement is planned on the earlier night and visitors are informed about the departure time accordingly. It was roughly 3:15 a.m. when we left the cottage. We zipped around curving roads, in pitch darkness, to the sounds of roaring engines. Everyone was in a hurry to get to the top of the mountain. I wasn’t very nervous, but I was having some difficulty breathing. Eko pointed to Bukit Cinta (Love Hill) and Bukit King Kong (King Kong Hill) on the way. 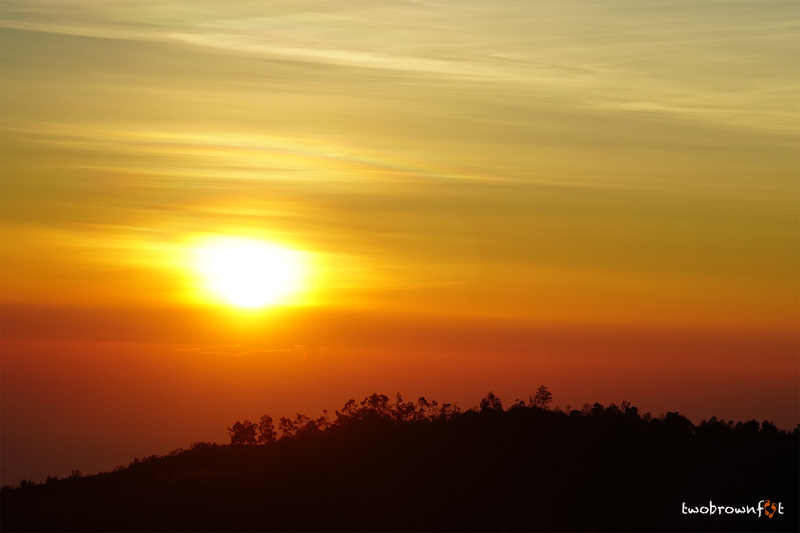 Many locals prefer to watch sunrise from here because it’s cheaper and easier to reach. After a point, once the the mountain road was clogged with jeeps on either side, we had to get off and start climbing. It’s not a long climb, but I was feeling breathless. Eko looked at me with a sorry face. I tried not to get annoyed and continued to climb after breaks. 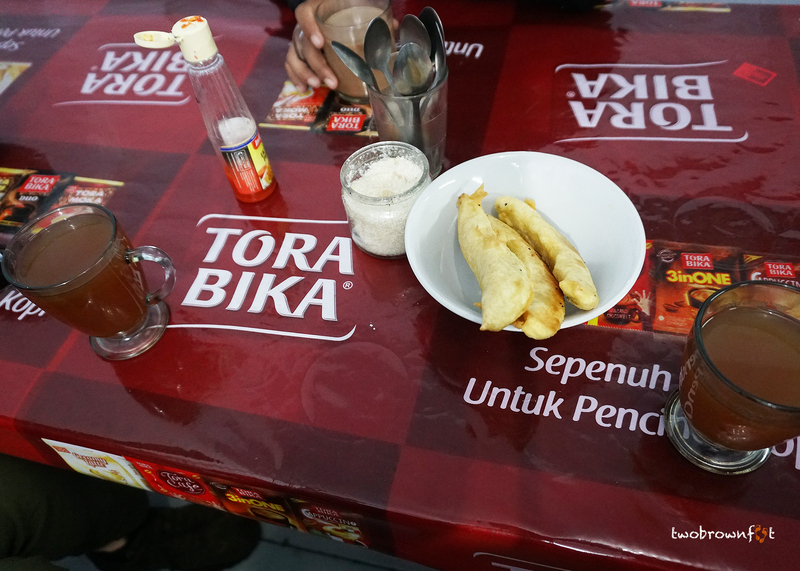 There are many food stalls at the entrance of Penanjakan 1. I wanted to catch my breath and eat a small snack. Unfortunately, everyone was smoking around us. Our neighbours, at the adjoining table, were rolling joints. Many locals were feeling cold and were dressed to beat sub-zero temperatures. After spending 2 winters in Korea, my body thought the temperatures was pleasant so far. The seating area at the viewpoint was packed with excited locals. Even the railing was packed with people blocking spots. Eko went to pray and would join us later. I found a spot between a pillar and a girl blocking my view with her hand. She nervously looked for an invisible friend. After 15 minutes, my patience had worn out, and I asked her if I could peak around the pillar. She said it was OK, but she was holding that narrow patch for her friend. I’ve always thought that travel brings out the best in people. I guess I was wrong. We all want a piece of a memory and will fight to get it. When you think about the money and effort that goes into a sunrise, even the best of us might give up our ideals. I saw people jumping under the bars of the railing and I urged Basil to do the same. I joined him after realising that I didn’t want to fight for the sun. It kills the purpose of the experience. It was a long wait to see the first rays of sunlight pierce into the darkness. It was hard to differentiate clouds from fog. 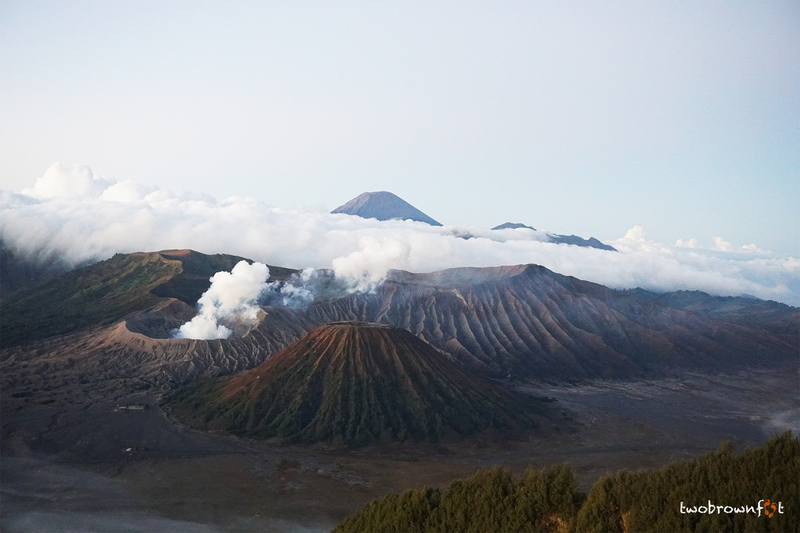 The first views of Mount Bromo, in the cluster of mountains, was breathtaking. It wasn’t easy to capture the mountain with insufficient light. A caldera (or crater) is formed when the mountain top collapses under its own weight — after massive explosions of magma — in a short period of time. It is believed: the ancient Tengger Caldera (the large crater surrounding the 5 mountains) was formed as a result of a massive explosion that occurred, around 100,000 to 200,000 (or probably more) years ago, in the parent mountain. 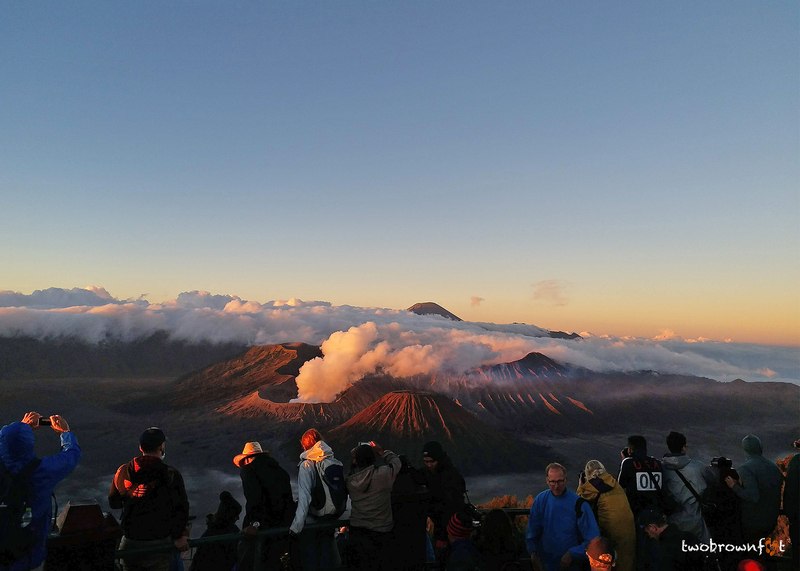 The volcanic complex, in the ancient caldera, is made up of 5 mountains and Mount Bromo (2,329 m) is the most popular because of smoke pluming from its crater. Mount Batok (2,470 m) is the extinct volcano in the foreground. 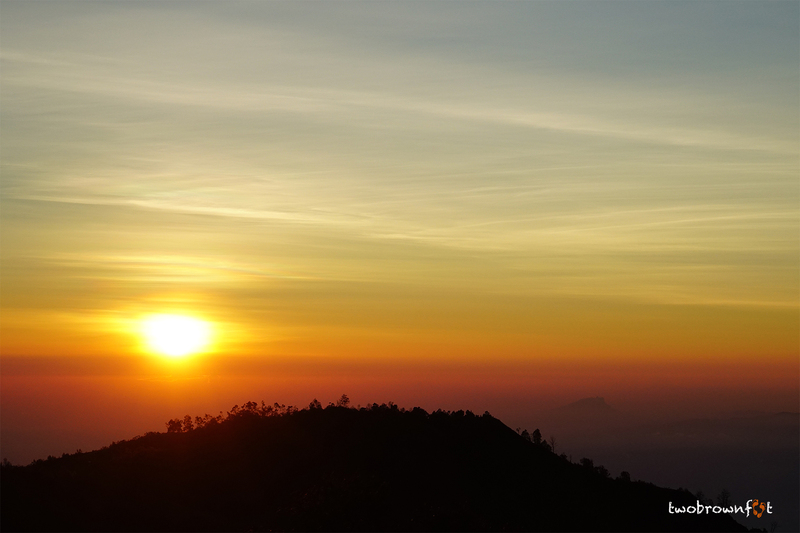 The other three (Mount Kursi, Mount Watangan, and Mount Widodaren) blend seamlessly into the Tengger Massif. Mount Semeru (3,676m) rises up in the background. 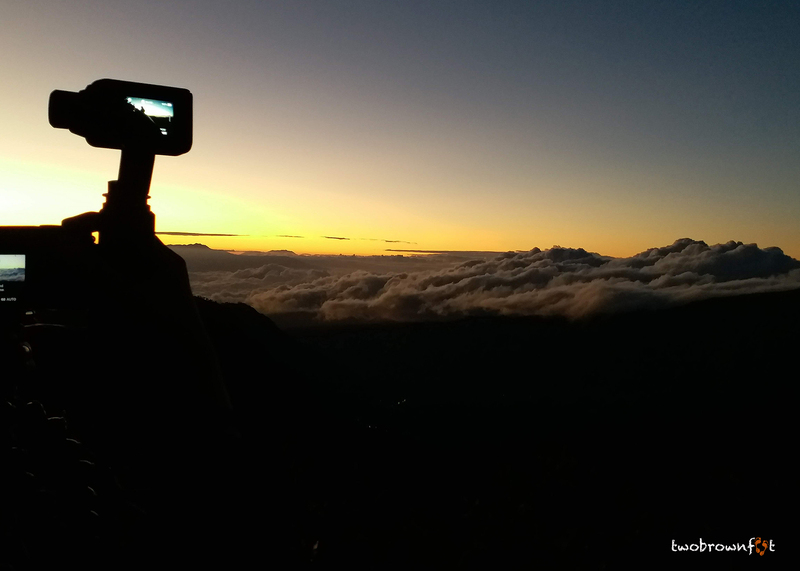 It’s hard to keep a track of the rising sun and also get a good shot of the mountains. The mood was upbeat and someone started playing, House of the Rising Sun by Animals. The timing couldn’t be more perfect. 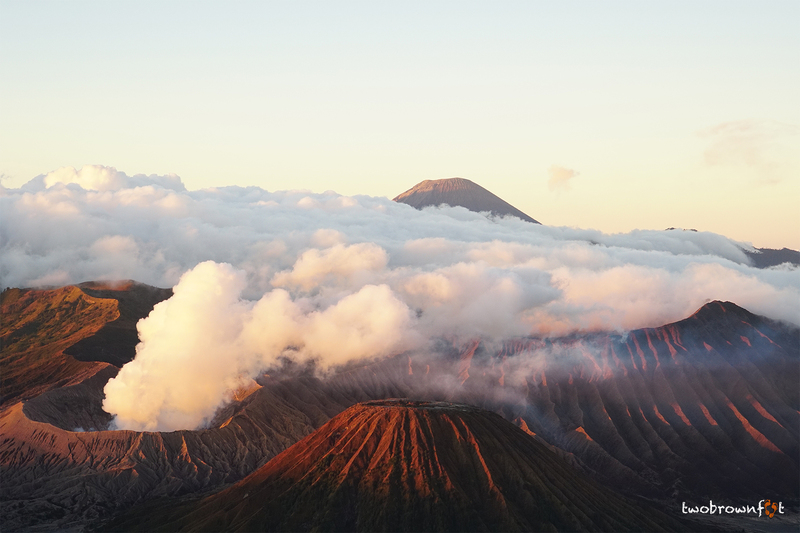 Mount Bromo looked surreal with every extra ray of light spilling over it. The primeval volcanic complex burst alive with shades of brown and pops of green. 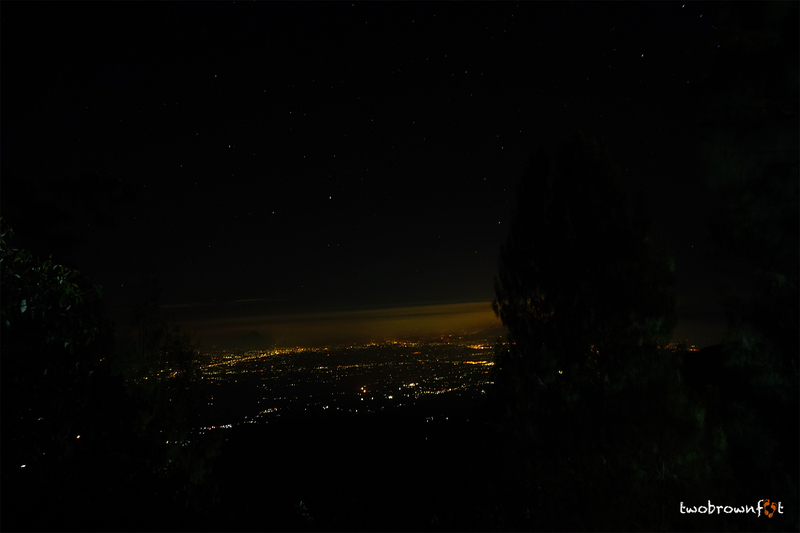 Cemoro Lawang, the village to the far left of the landscape (second pic), was finally visible. I tried not to shiver and focus on the sight before me. How often can we look back into the past? For a moment, I could even imagine what life must have been with dinosaurs roaming around. Although, I’m not sure if that was the case here. We gave up our places to focus our attention to the rising sun. The sun was diffused in the sky. It looked as if someone had smashed an egg yolk above. I’d have liked to be alone in this moment. But, that’s not possible when you have bobbing heads and excited shouts all around you. Was it worth it? Absolutely! It’s a small price to pay for the experience. As the sun rose higher, tourists started leaving. I wanted to stay back for a while, but Eko wanted us to continue. 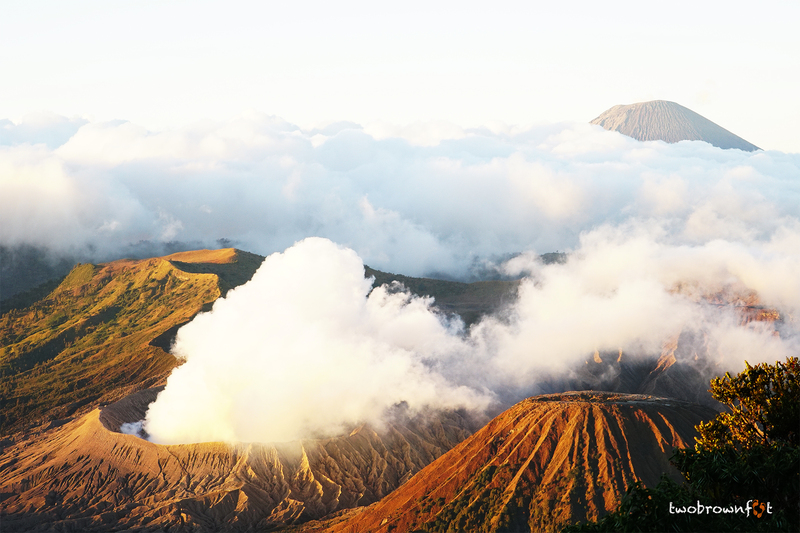 The smoke from Mount Bromo mixed with the fog and created a magical sight. We had to walk back to our jeep and it didn’t take too long this time. We were happy with our sighting, even if Eko felt the fog wasn’t as spectacular. Tourists were still climbing up the mountain. It would be quieter than sunrise viewing. I was pretty excited now and nearly forgot that we hadn’t eaten breakfast. 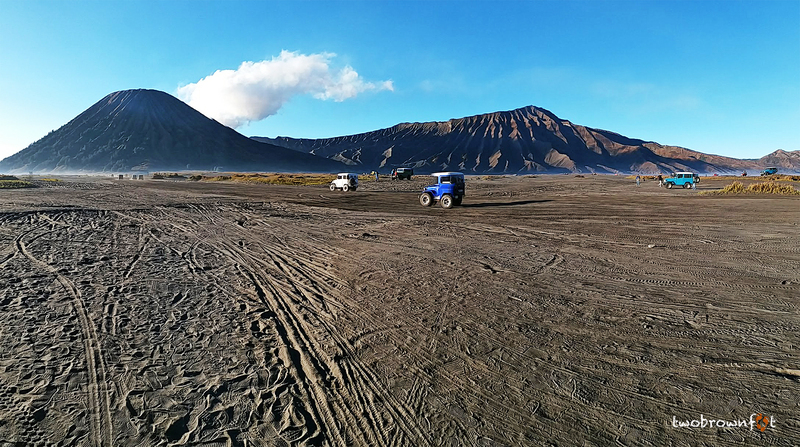 The views kept getting better as the jeep wobbled on the narrow road to the Tengger Caldera also known as the Sand Sea. The area gets its name from the vast bed of dark sand that surrounds every inch of the caldera. Eko didn’t seem to share our excitement. Perhaps, he’d been here so often that there was nothing new about this experience. Basil and I were high on all that natural beauty around us. 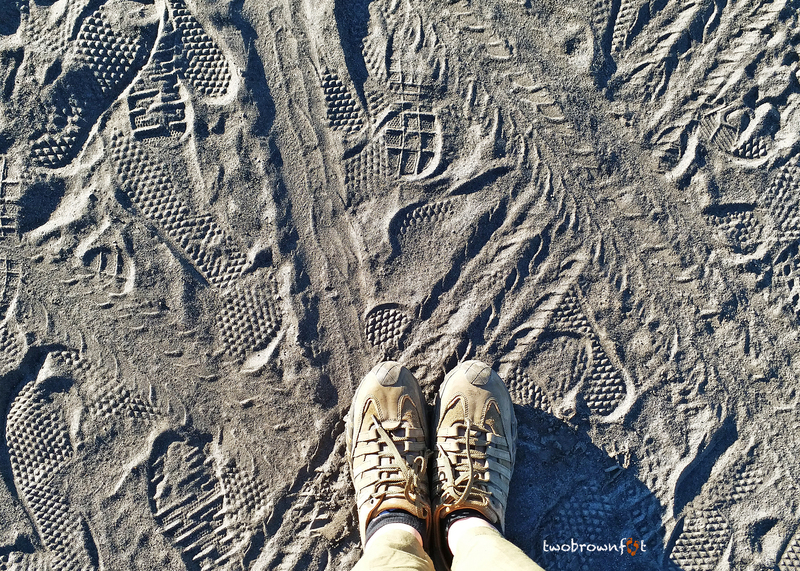 There were footprints mixed with tyre tracks and hoof marks. 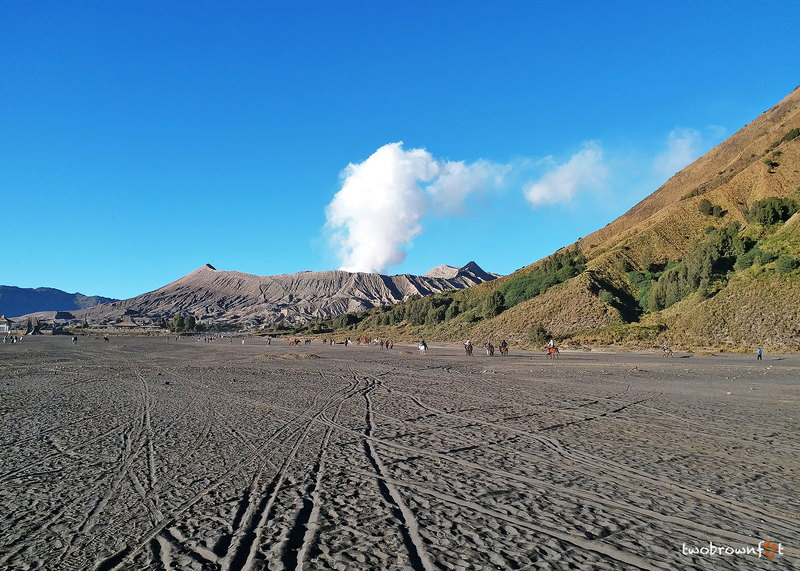 It isn’t very far to Mount Bromo from the parking lot, but our package had a horse ride included in the trip. Besides the sun was heating up the place. I didn’t have much difficulty finding a pony. Basil wasn’t as lucky and had to walk for a while until he got a willing horse. The horse would take us to the base of the stairs and we’d have to climb from there. Eko looked at me as if I wanted to take the horse up the mountain. I was too excited to let his negativity (or lack of faith in my ability) affect me. We were going to climb Mount Bromo! What a truly wonderful experience. Great photos. Thanks, Margaret. 🙂 It’s gone to the top of my list of wonderful travel experiences. Amazing place and shots! Thank you for taking us. Great photos of what would be a very memorable experience, I am sure. I’m so glad you’ve posted these – when we were there, the clouds were so low and the fog was so thick, we never saw this view! In the end, we only saw the sides of the volcano as we hiked up to the top. While it’s bitter sweet to see what we missed, I’m so happy to have here! That’s sad! 😦 We’re so dependant on nature and the weather for great views. I wasn’t expecting much until we reached the top. We had heavy rains on the previous day and I went without expectations. I think we got lucky! Thanks for sharing your experience with us. Isn’t that the truth! I’ve always been pretty unlucky with weather, especially when traveling. Here’s hoping my next few adventures will play along better! And thanks again for sharing so many of yours! I remember another blogger writing about the weather and how it spoiled her trip. 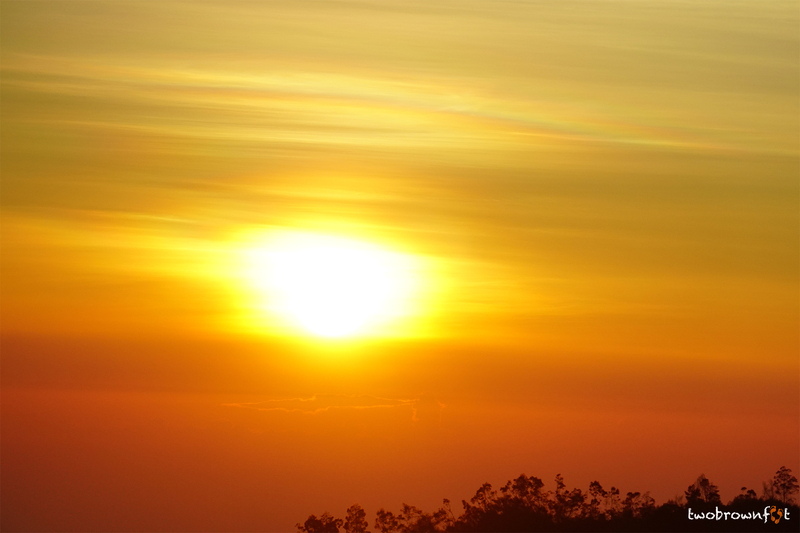 With changing global weather, it’s difficult to get the ideal setting anymore. 😦 Hope your future travels have sunshine in them! Hugs. This brings back many happy memories for me. Luckily, I didnt have to experience what you and Basul went through in Penanjakan. Hate the crowds. 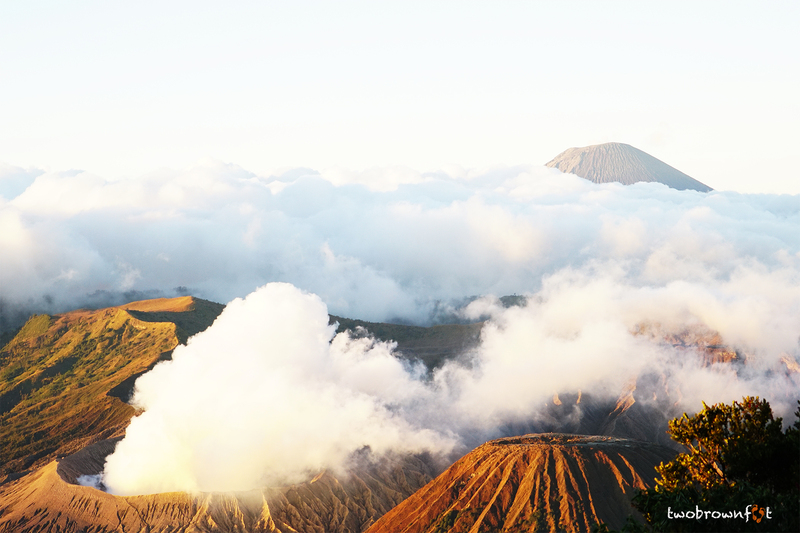 Bromo is incredible! 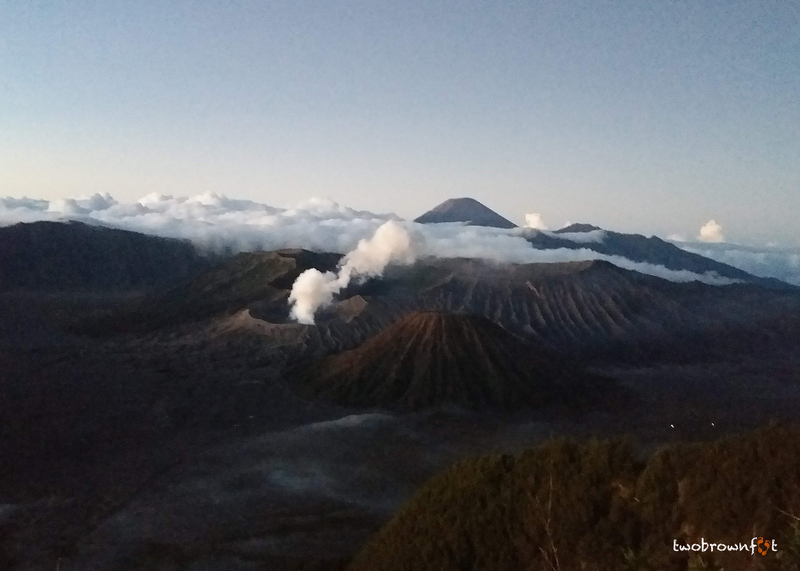 Thank you for such a wonderful account of your trip to Bromo. I tried to keep your advice in mind whilst deciding our trip. July is peak tourist season and it’s hard to escape crowds. We had such a narrow window for this trip, but I don’t regret it. 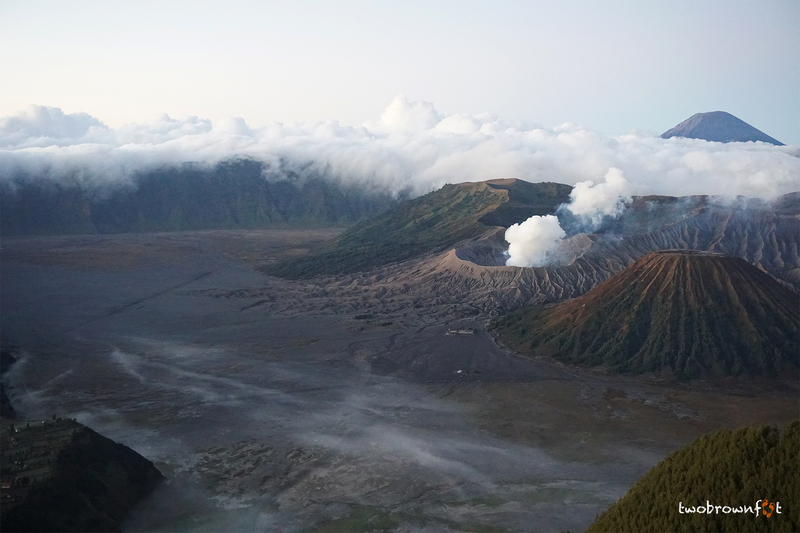 Bromo is spectacular! You’re an intrepid travelling duo, Cheryl. It all looks so primal! Expecting dynasaurs to pop up! Great storyline and shots. Our blog makes us look like that, Liz. 🙂 Travel has helped me overcome my fears and learn about history and culture. I’m a fan of dinosaurs! Jurassic Park (the book) was an all-time favourite. Thanks so much for your lovely comment! some stunning pictures. Shot with mobile? especially the golden hours? I think mobile surely is the most convenient way. Pull out, compose and click! Right? I think I might have gone mad with the annoying crowds, but your sunrise views (and even better to me, the post-sunrise with the fog) were worth it. Eko sounds like a pill! Impressive, beautiful, but I suspect this is one of those places where you really need to be there to drink in the full grandeur. The first shots of the caldera smoking look too amazing to be real! I agree! It’s gone to my top 5 travel experiences. I love the sun!